A recent blog post from Overnight Prints explains the value of a coupon campaign and why you should include a promotion in your print materials. The article gives statistics on consumer behavior, why coupons attract customers, and how coupon campaigns benefit your business. To learn more about why you too should include coupons in your print materials to promote your business, read Print materials are vital for cost-efficient coupon campaigns. 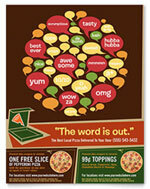 Now get the word out about your business with a coupon campaign! Coupons can be used anywhere and are easy to add to your postcards, newsletters and other print marketing materials. If you don’t have graphic designs for your business already, try starting with a StockLayouts template. Make some space and rearrange graphics to fit it in your design. 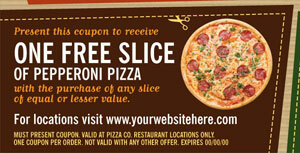 Include a dashed line to make it stand out as a coupon. Study your competitors’ coupons and consider what they did well and what you can improve on. When done correctly, coupons can increase awareness and offer an incentive for new customers to try your product or service. To get the most out of your campaign, try tracking coupon usage. Use bar codes, a color code, or include a tracking number to track who redeemed it, how they learned about the offer, or how well a particular message worked. Use the data you gather to improve future promotions. Get your coupon out to the world and watch them roll back in along with new customers and repeat purchasers! Have you had success with a coupon offer? Tell us about it below! Although outside the constructs of this blog, it would also be interesting to see how people are limiting the use of these coupons to make tracking more effective. Coupon codes work great in small niche markets. We have had many clients use keep track of the coupons they get back so they can determine how marketing concept worked. Anyone who is trying to make a decent living these days need all of the advise they can possibly get. Thank you for the articles and great info.